(warning to reader: I don’t have a printer and this is one of these articles that could be a white paper but I have found that white papers are best written by printing out stuff and rearranging so that it makes some logical sense in flow. This is about managing companies. 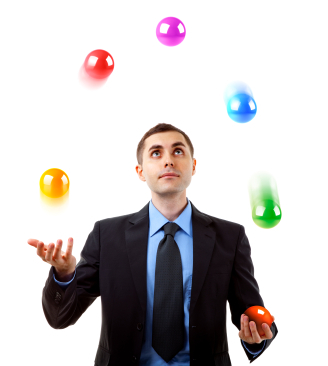 Organizational behavior and developing a company structure for success today and in the future. I presented this idea in a business consulting/brand strategy environment maybe 3 years ago (although I have used portions in business discussion for years). Interestingly in that presentation there was not a lot of discussion on a relatively controversial strategy/value proposition underpinning but rather the discussion focused on the organizational structure/behavior idea we shared. I call the idea “controlled autonomy” (others may call it a version of a self organized organization or a decentralized organization or a variety of ‘decentralized-like employee empowered’ terms). Here you go. The idea of ‘controlled autonomy’ for a company and the challenges and pluses. Managing companies these days seems to have become even more complicated than it has in the past. Everyone wants to streamline streamline streamline. 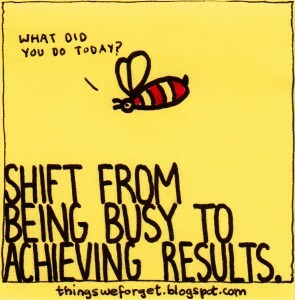 And often that means stripping away the “discontinuous” portions of the company with the intent to keep things moving smoothly and focus on the ongoing “continuous” activity (efficiency seems to translate to ‘speed to market’ for some reason and certainly translates into ‘higher margins’). Because it’s that discontinuous part that feeds innovation and some autonomy and friction/conflict to spur growth and responsiveness and the type of stuff that makes customers (and employees for that matter) happy (and you have just stripped it away in the interest of ‘maximizing efficiencies). In order to continue to maintain excellence and remain competitive companies really must adopt some dynamic strategies of discontinuity and creative destruction (and yet maintain continuous efficiencies). You better learn to be able to do it. Because companies that operate with management philosophies based on the assumption of continuity cannot change or create value at the pace and scale of the markets in the longer term. The company’s processes (which control actions) that have enabled them to survive over the long haul deaden innovation, day to day flexibility and constant need for change. Organizations are tough to manage. No matter how you decide to go (centralized, decentralized, a hybrid, or something some business book has suggested) there will always be pluses and minuses and challenges in managing an organization. To make it more difficult? …. there is no one path to success. While there is no one right path … organizations must learn to incorporate aspects of ‘dynamic and responsive’ to meet the market itself (assuming they are to sustain superior returns and thrive over the long term). In a sense I am talking about some business agility. The ability of a business to adapt rapidly and cost efficiently in response to changes in the business environment (and customer/market needs). Business agility can be maintained by maintaining and adapting goods and services to meet customer demands or adjusting to the changes in a business environment. Controlled ‘agility’ (an aspect of autonomy) is a concept that incorporates the ideas of flexibility, balance, adaptability, and coordination all within some construct. It actually can be done. And it isn’t that difficult. Let me say it isn’t difficult if you trust your people (the employees). 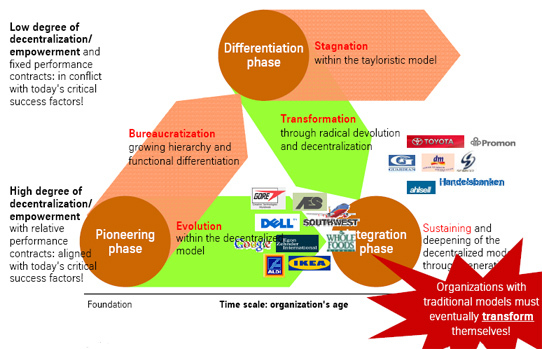 What do I believe is the way to create the continuous discontinuous organization? The phrase of the day (or at least this article). Controlled in that there is a vision, a focus and a functional understanding of what the company actually does (what is it we do well). What that really means is that no matter how you slice it organizations are ‘tense anxiety-driven’ structures. That is also part of life in an organization. And, oh by the way, that is the dynamic portion of businesses that permits change to meet changing markets. How about this as a leader? The chairman of IBM during the 1930s once described the most important factor in his success as doubling the number of failures. When I was younger I thought hierarchy was the only way to run organizations. I always believed that an organization couldn’t exist without a hierarchical chain of authority. Now I understand there are a variety of ways to run an organization (I am simply focusing on the autonomy aspect here). I have always had a sense that empowering employees in some form or fashion is an effective management (organizational behavior) direction. The maintenance of organization in nature is not-and cannot be-achieved by central management; order can only be maintained by self-organization. Self organizing systems allow adaptation to the prevailing environment, i.e., they react to changes in the environment with a thermodynamic response which makes the systems extraordinarily flexible and robust against perturbations from outside conditions. That thought didn’t really rock my world but it seemed to articulate something I had lurking in my management portion of my brain (they also had a variety of whizbang charts to go along with it). I know I am tossing around several terms (controlled autonomy, self organization, responsible autonomy, controlled business agility) but they are all degrees of the same thing. 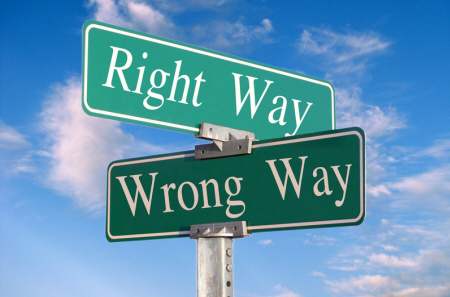 Regardless of the nomenclature (I will stick with controlled autonomy) it is all about clear organizational direction and focus, alignment and agreement on that focus/core and autonomy to implement. I am arguing for ‘some’ autonomy (organizations dictate amount of autonomy based on their market situation, organizational alignment and agreement on focus). Nowadays there is often a blurring of boundaries between shopping, learning and the experience of culture (its really no longer sales versus marketing versus operations and if an organization is ‘stuck’ in that mindset they should be prepared to go the way of the dinosaur very very soon). As a more agile organization culture (of which is exactly what I am talking about with a controlled autonomy) the company has an ability to blend into the marketplace (versus rigid institutions unable to flex). Technology has certainly affected my own believe in effective organizational structures (and I don’t believe I am alone if I read Harvard Business Review or use that European Commission report I cited). Technology has changed the way organizations should act because it has changed how the world interacts – the way we shop and consume. It creates new opportunities and destroys businesses that are unable to adapt to a sudden discontinuity with our past. Quoting Susan Baker, a Cranfield School of Management researcher “The Internet aggregates the actual brand experience, it discloses and amplifies the mismatch between companies and their customers, which can be seriously disrupted”. Circling back to something else I have written this is a version of Creative Destruction where the underlying theory is that businesses are built on the assumption of continuity to be most effective/efficient yet the markets the businesses perform in are built on the assumption of discontinuity (constantly seeking new creation and destruction of old). It is true that enhanced innovations (thru technology) have impacted businesses in that businesses are faced with a tougher job when innovation and flexibility are the markers for competition, rather than efficiency being the fundamental driver of value. And this is a fact for all businesses and industries (b2b, service, CPG, technology, whatever). And back to the blurring thing. Convergence of these technologies means that businesses are beginning to blur with other industries (and there will be new cannibalization which a business has never seen before). I mention that because if an organization doesn’t maintain some agility they won’t be able to swing resources around to meet unexpected forays into their business space. The way to stay ahead of this is this controlled autonomy thing I suggest. Why the heck haven’t companies made more strides in this direction? Change, particularly among experience senior people, is very difficult. Despite all the evidence, we keep self directing organizations into many variations on the centralization themes. 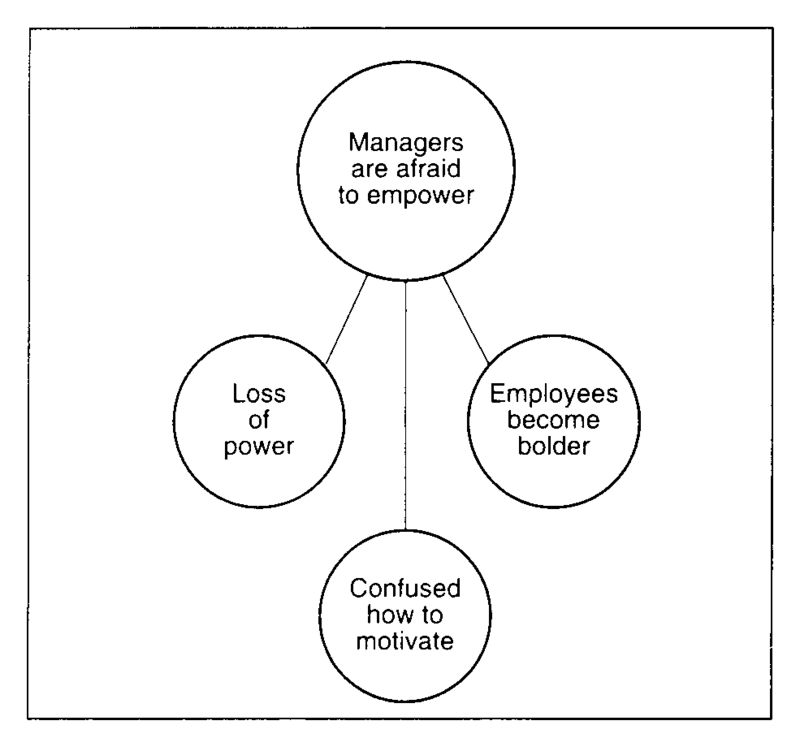 What makes things even worse is how senior managers in many dysfunctional organizations (of which I have been in several) proclaim empowerment, participation, collaboration, teams, leadership, trust, and all that stuff. But they ‘dip their toes’ into self organization/autonomy and often take partial measures while expecting total success. They liberate parts of their organizations while limiting other parts. They liberate some decisions and limit others. They push hard with one foot on the accelerator while also pushing hard with their other one on the brake. Their words say, “You are empowered”. Maybe because the controlled autonomy is a contradiction it is tough. And it creates dysfunction. And it needs a powerful strong charismatic (however you define charismatic in that people will listen and follow) leader. Because dysfunctional organizations end up trying to go in two opposing directions at once and it gets frustrating and the rest of the organization feels the ripples. Frankly, most senior leaders (centralists by management nature) don’t set out to deceive anybody. In their heads they know that high degrees of involvement, participation, and autonomy are key elements in high organization performance. But in their hearts, they still crave orderliness, predictability, and control. But most fail for one really simple reason. A central “plan” cannot dictate and bring order to a haphazard, unpredictable, and rapidly changing world. With a continuing stress on “bottom line” or making margins as high as possible leaders fall into the financial analysis trap. Financial analysis can clearly show that consolidating and centralizing support services and functions saves money and increases efficiency (in huge PowerPoint graph slides in the conference room). What doesn’t show up is the alienation, helplessness, and lack of connections to customers or organizational purpose that centralized bureaucracy often brings. Efficiencies may save hundreds of thousands of dollars but the processes to do so can be energy draining and passion destroying to the people within the organization. Bottom line is traditional accounting systems can’t show the hundreds of millions of dollars lost because of lackluster innovation, mediocre customer service, uninspired internal employees and financially driven outside partnerships. And, of course, the biggest concern is the inevitable loss of agility and ability to adapt quickly (I added quickly because visionary leaders can certainly lead change/adaptation but often not as quickly as ‘down-to-up’ adapt input). The idea here is giving people a good degree of autonomy surrounding a clear vision. – Everyone can see and manage their work as part of a whole organism not a bunch of manufacturing “Borg-like” parts and pieces. – Employees (and often outside partners/alliances) are trusted and treated as responsible, caring, and committed decision makers (often creating behavior not unlike “part owners” of the business). Ultimately the sense of ownership, commitment, energy, and passion levels are much higher. – It is a fact that small self-contained teams or business units are more flexible and responsive at meeting threats and capitalizing on opportunities. – Everyone focuses on meeting customer/partner, not internal bureaucracy/process needs WHILE doing so within a strong sense of organizational culture. – People have more control over what they are doing replacing the helplessness of working within an inflexible construct (this also has the added benefit of eliminating, or limiting, the transference of anxiety up toward leadership). – Feedback and response mechanisms are much shorter and closer to the customer and markets. 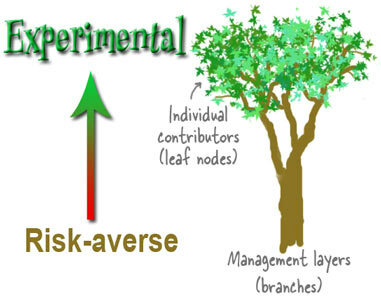 Highly decentralized structures are not for the management faint of heart. Management is giving up a significant amount of control of people so that employees (or the organization itself) can control their own and the organization’s destiny. But when it works the employees and organization is happier and more positively dynamic. Organizations always carry with it a thread of anxiety or stress within it. Some days very little and some days a whole shitload. In general organizations are tense, uncomfortable and stressful places. In a centralized organization the stress gets compounded by aspects of organizational practices, processes and structures which serve not only to enable task completion, but also unconsciously serve as defense mechanisms to cope with anxiety in that it permits employees to transfer feelings of anxiety toward leadership (or the leader). Why did I add this at the end? To point out to any senior leadership you are damned if you do and damned if you don’t. I would argue controlled autonomy may increase your purchase of Pepto/Maalox/any antacid but only until your organization falls into a rhythm (that you can actually manage if you are crafty and a herder). In a centralized organization your own stress doubles (ok. maybe exponential) because you are stressing the organization with inflexibility and handling organizational anxiety/stress as it is being handed back up to you in their frustration). 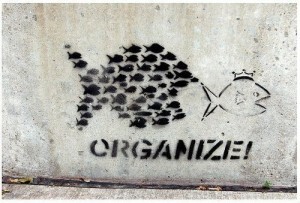 I am all about stimulating self organization encouraging some autonomy where leaders manage system not people. I guess what this means is that leaders in controlled autonomous organizations set the “core compass point” so whenever anyone tends to stray they can find the path back and then leaders manage boundaries (say … well … they insure that as people stray they don’t stray too far). I guess I am a border collie at my core. And I imagine many senior leaders could learn some good lessons from a border collie.